Childhood sweethearts Deborah and Keith from Ballina have known each other since they were 12 years old. They went to school together, and began dating around the time of their Leaving Cert. Keith popped the question on a trip to Cuba in 2015 while the two were enjoying a day of adventure on the Hicacos Peninsula. 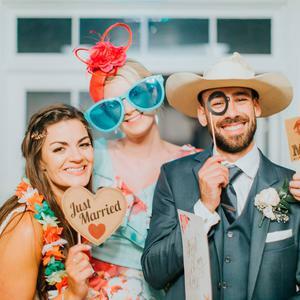 The couple planned for a laid-back, 'not too traditional' August wedding with a small number of guests; with the emphasis on good food and good fun. 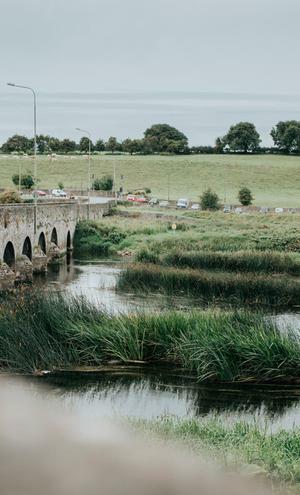 They chose The Millhouse in Slane Co. Meath as the venue for both their ceremony and reception, saying their 'I do's in The Mill where their mothers recited poetry in a personal, relaxed interfaith exchange of vows. Their photos are by Niamh Smith. 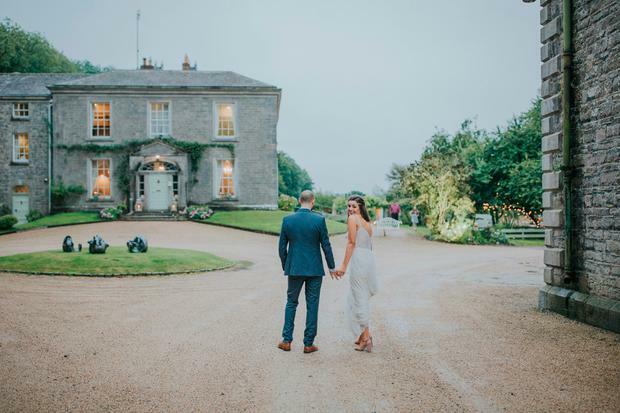 For the couple, The Millhouse was the perfect place to host their wedding celebrations- it was the first place they visited on their venue hunt, and they fell in love with it straight away. "We loved everything about it," said Deborah, "the setting, the house, the mill. 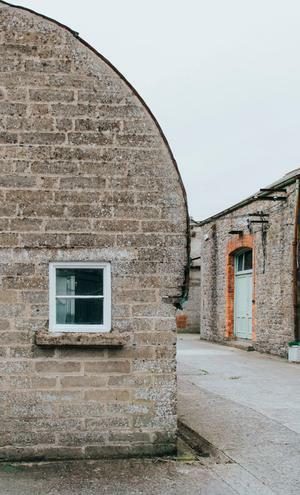 We loved the idea of having the venue all in one place and loved the way The Millhouse feels very special but also laid back. From the moment we went there, we just felt like it was exactly the kind of wedding we wanted." 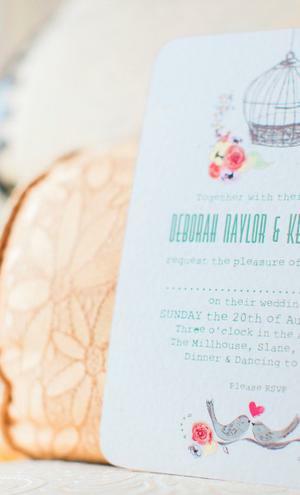 "It does get stressful," says Deborah about planning the big day, "and in the beginning it can be a little overwhelming! But it’s a such a lovely thing to look forward to." 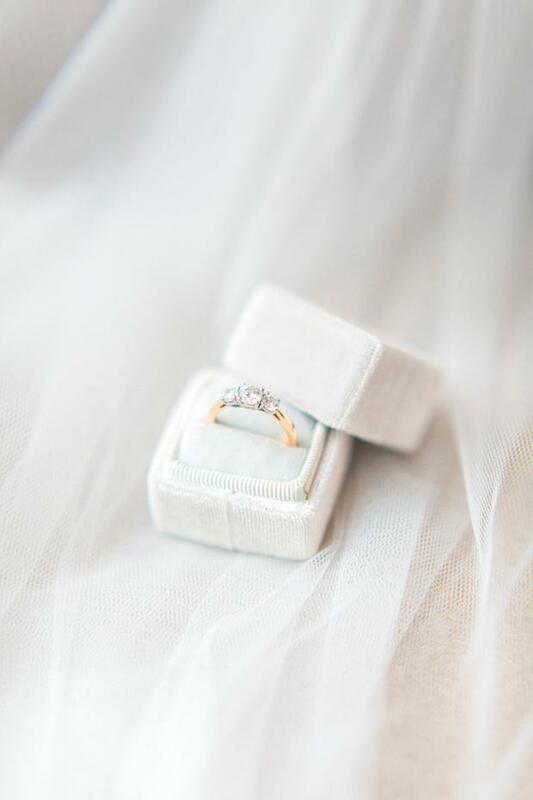 The couple wanted a "pretty, but unfussy" style. 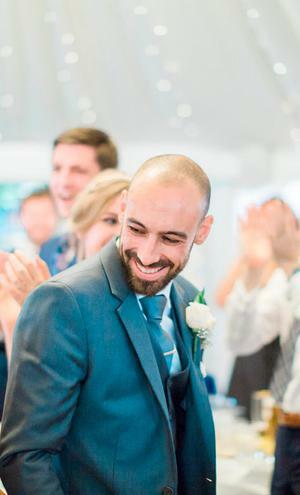 of wedding They ordered their invites from UK-based wedding decor and stationery e-tailer Wedding in a Teacup, adding a bit of a DIY element themselves with some baker's twine. 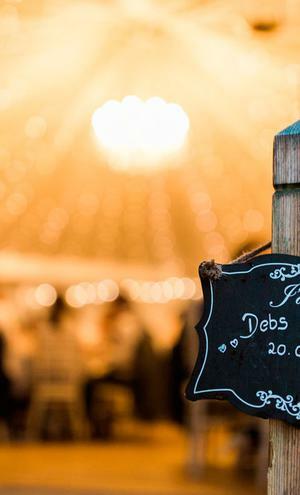 Deborah continued the personalisation of some of the decor with gorgeous table settings, using off-white luggage tags for place names, which she stamped with a beautiful bird stamp, and tied them together with bird cards ribbons wrapped around them. "For our table centrepieces we reused the flowers in The Mill," said Deborah, "...lavender and baby’s breath bunches and bought these cool wine jars to put them in. We also decided to buy a polaroid and lots of props instead of getting a photobooth - it was lots of fun. Also we had lots of bunting, and photos up. We had lots of other little bits to decorate like mini chinese lanterns and lots of giant white balloons." Deborah found her wedding dress in Folkster in Kilkenny. It was by Chic Nostalgia. 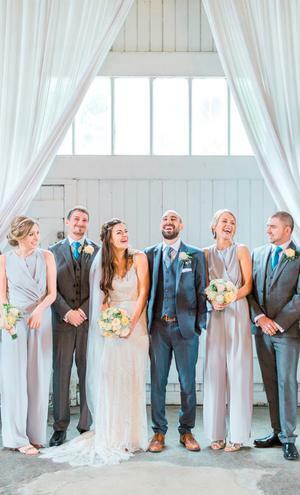 The bridesmaids wore jumpsuits from Coast and the groomsmen wore suits from Marks and Spencer. "Wedding dress shopping was fun," Deborah said of finding her gown, "but can be a little daunting the first time you go in! I realised pretty quickly I wouldn’t be going for a very big dress, I looked in a few places but then went back to Folkster - I loved all the dresses there." For the couple, their interfaith ceremony was the most special moment of the day. "It was intimate and because we had some much input in it felt really personal," said Deborah. 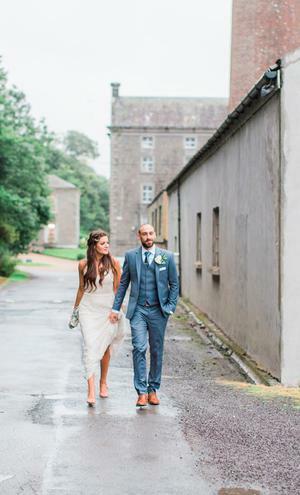 "We chose traditional vows, and had both of our mum’s recite a poem - including a Seamus Heaney’s Scaffolding. Our celebrant did an amazing job. "Our band Gorilla Radio were amazing as well - we had booked them before we had even booked the venue! Everyone was on the dance floor all night long - it was the best craic. Our ceremony felt really intimate and special and Keith’s sister was our singer which was amazing. I loved the speeches too - my dad, husband and the best man did an great job! They were hilarious. 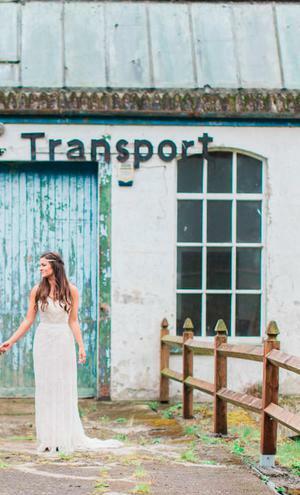 We both enjoyed everything about the day - even though it goes by in a total blur." 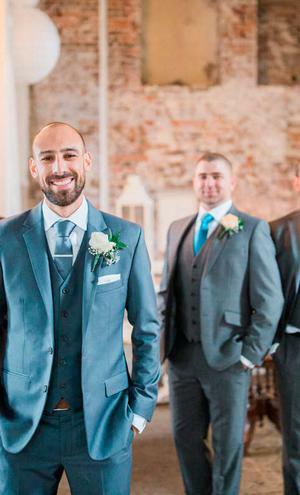 Keith went a little further afield for his wedding day look, getting his suit tailored while the couple were on a trip to Vietnam. "We were in Hoi An which has amazing tailors and he got made in a place called Kimmy Tailors. Took two days to make with a couple of fittings." For the dinner, guests had black pudding and pear salad for starters, followed by a choice of fillet steak or salmon with prawn and sancerre white wine sauce for mains, and Dark chocolate hazelnut brownie with whipped amaretto cream & hot chocolate fudge sauce for dessert. "I wanted to go for a lovely chicken liver pate with cherry compote for starters - but decided to go for safer options that everyone would eat!" said Deborah. Their evening food was toasted sandwiches and mini burgers. Deborah and Keith honeymooned in Greece, visiting Athens, Santorini, Paros and Crete. 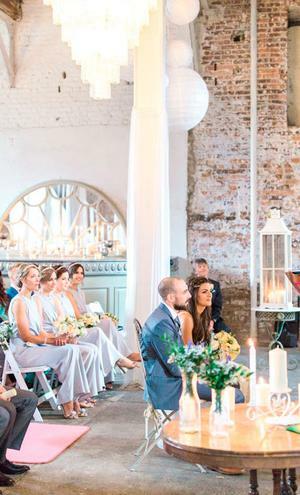 When it comes to the big day the couple had plenty of good advice for other couple starting out with their wedding plans. "Make decisions quicker. I probably over researched some things, if you like something, just go for it. There are so many decisions to make, don’t overthink the small stuff. There’s a happy medium. Wouldn’t have changed anything about the day except the weather! It rained a bit, but that’s par for the course in Ireland. "The other is the cliche - don’t stress! Things can and will go wrong and the planning does get stressful - try not to let it. On the day - relax and remember at the end of the day it’s your wedding day so enjoy it together as well." 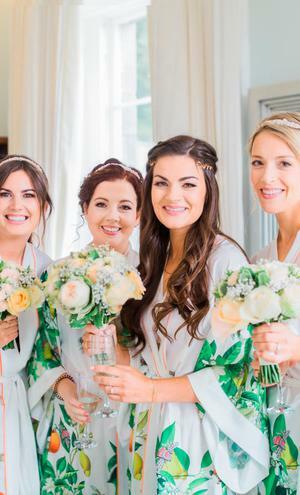 Would you like to see your big day featured on THEVOW.ie? We want to hear from you! 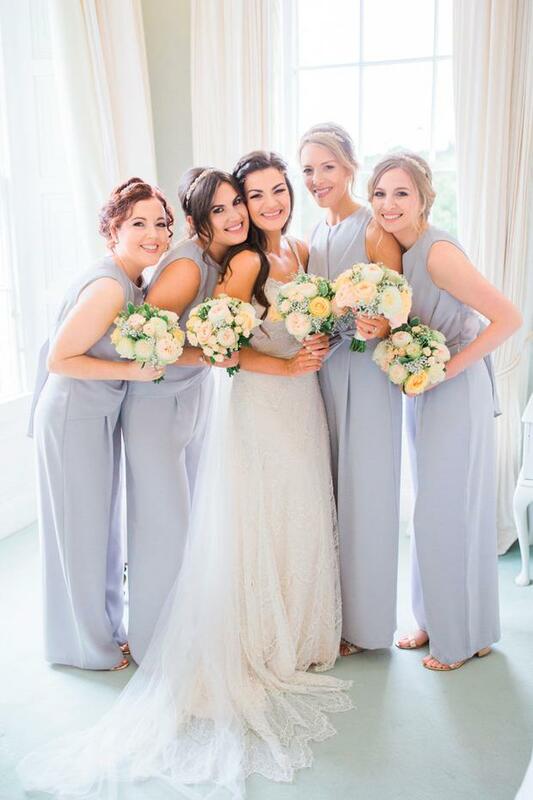 Simply send your names, wedding date, wedding location and the name of your photographer or your wedding videos to Editor (@) thevow.ie and we'll get back to you!